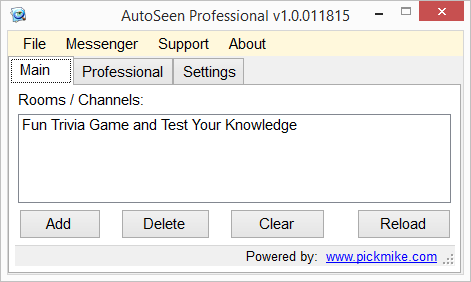 AutoSeen Professional is a program for Paltalk that you can use to see if a friend or any other user in Paltalk has come to the room when you was not there. A !seen script allows a user to type !seen nick, and it will display when the user was join/left last in the room, whether or not he is already in the room. This script will work with Paltalk only at the moment. I’ll integrate with other Messenger later on. * Fixed: Joined/Left users sometimes were not able to record to the database. @NYVE now this one is pretty awesome. I am sure many would love this. @Karim, Its sadly not Possible on Paltalk to Search where users are chatting or in what room on Paltalk. There is a reason for why Paltalk doesnt allow that. Paltalk want People to have at least “some” privacy. If people want to share what room they are in then they can use the “(Show Room)” or “< >” options in Away Message. We have to respect that.